Domaine Dupont Cider in the U.S.A. There is a growing interest in the the United States for ciders as a casual social drink. Natural, with a lot of fruit, low in alcohol, cider is a nice alternative to beer. The elegant style of Domaine Dupont Ciders make them ready to suit that trend. 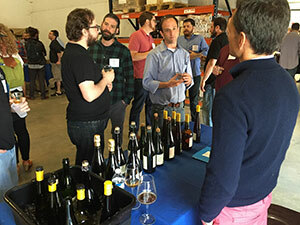 Jérôme Dupont was in Oxford, Connecticut, to present Domaine Dupont Ciders at the Nepenthia 2015, an event organized by B.United International, distributor of the ciders of Domaine Dupont in the U.S.A.
Another Domaine Dupont Cider tasting was at Seymour The Pub in Greenfield, Ma, in a region well-known for apple trees and… its cider. – 4 oz of Cuvee Colette, which fills the rest of the glass.